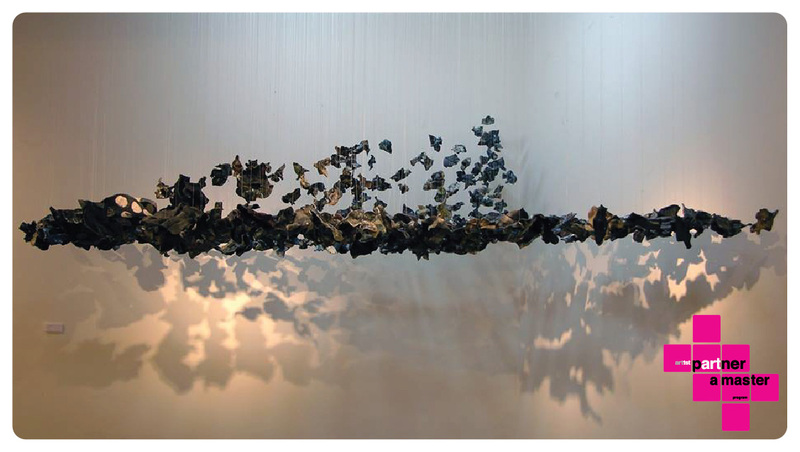 The work Rites of Passage (2006) was composed of a group of 350 black butterflies that was enclaved and was suspended at a height of 7 feet and the onlookers could walk underneath it. It was in the shape of a missile. The work exhibited a charged space just below the ceiling and above the ground. Kristine employed a firing technique to get the black tinge and the metallic tints thus accentuating the play of light and dark through her installation. The floating ambience of the piece using butterflies as a strong motif; which is in the midst of its own process metamorphosis and therefore undergoing a rite of passage. The imagery of the butterflies used, anticipated their own moment of transition through this work.